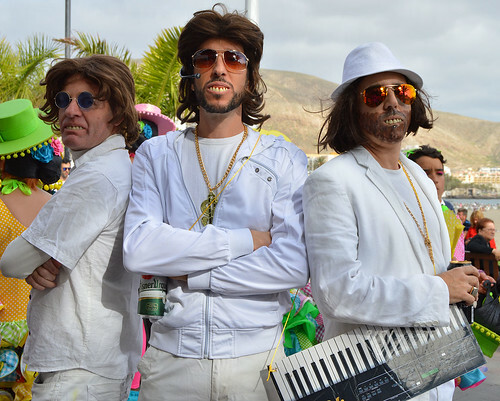 A sizzling hot dog was thrust into one hand and a cold beer into the other and I was still just outside the showground in Los Cristianos, Tenerife, for the daytime carnaval celebrations. 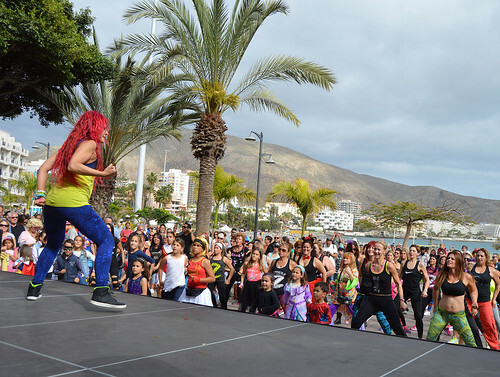 The parking area next to the Valdes Centre had been hosting the late night shows all week but now there was a youthful feel with a noon start and top acts from Spain’s top 40 pumping out infectious dance tunes. 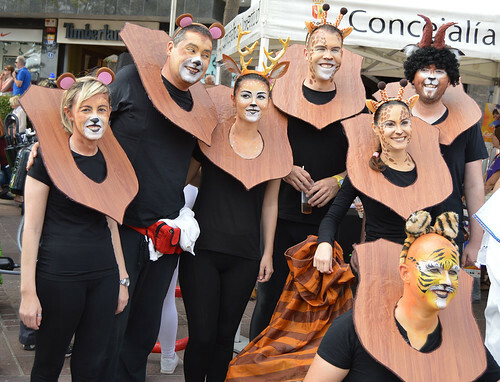 Local supermarket shelves had been depleted as a multi coloured fancy dress army swept through like thirsty locusts and small groups gathered around clinking bags on the upper walkways of the commercial hub. 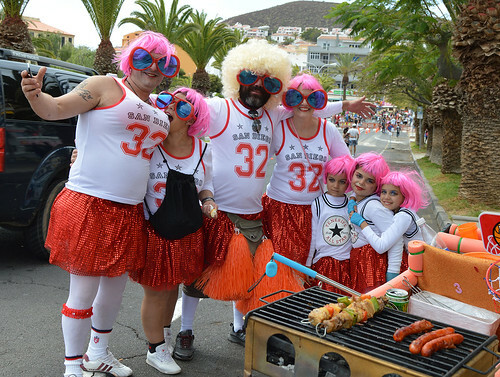 The BBQ greeting was a tasty welcome and I even managed to eat and drink while clicking away at the sea of wonderful costumes that awaited me. 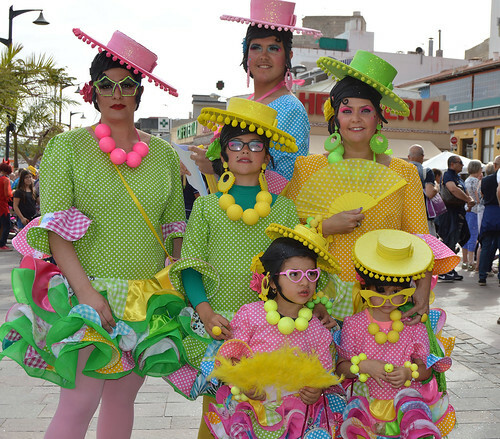 The previous weeks cabalgata opening parade was a bit more regimented, this afternoon revealed the hard work that had been going on in many homes to deck out entire families in original and amusing outfits. The bank of speakers ensured the music was heard and felt and the bars and food stalls inside the showground were also doing a roaring trade as inhibitions were loosened. 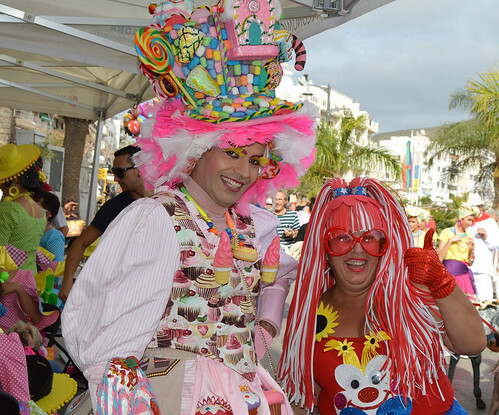 Traffic was diverted from a couple of the main roads into the city centre and the crowd ebbed and flowed down towards the seafront as police and the fire brigade kept a discreet and watchful eye on the fun. 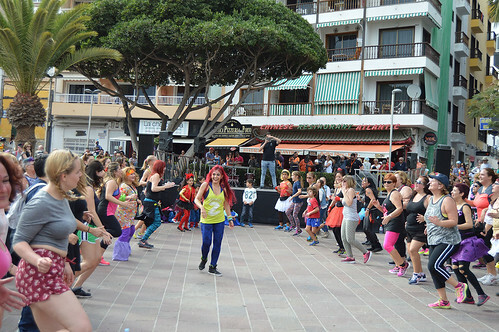 There was another focus for the party, Plaza del Pescadora near the old beach had it’s own smaller stage and was featuring zumba and dance. 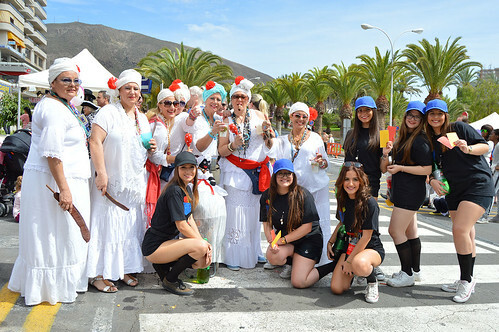 I felt quite exhausted just watching the energetic exertions of the dance groups but plenty of holiday makes were drawn in to shake a leg. 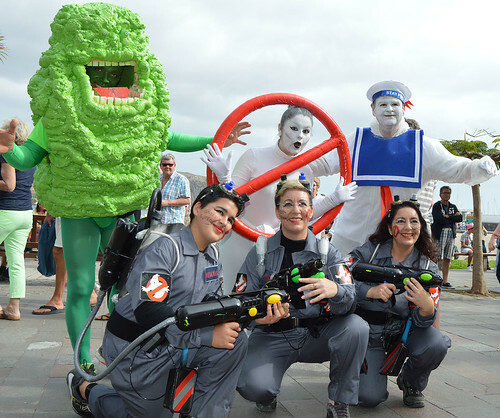 A fancy dress competition was lined up for late in the afternoon and each new batch that arrived brought more admiring glances, the Ghostbusters, and The Bee Gees complete with a mass of chew sets, were among my favourites. 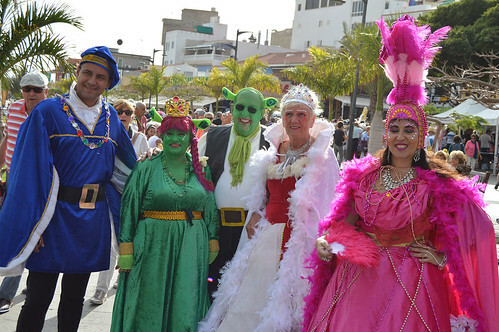 They were all winners in my book and more music and dance followed their spell in the spotlight. I headed back up through the showground and the crowd still had plenty of energy. 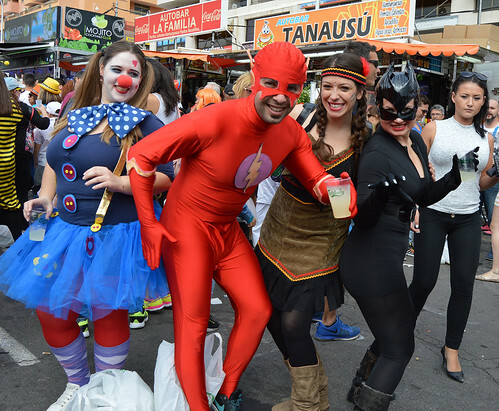 The big stage featured late night into early morning music and dance each night of carnaval and the fun fair next door was enticing screams of enjoyment as super heroes and cartoon characters crammed into gravity defying seats. 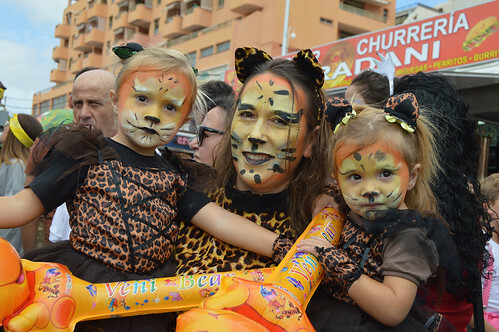 The day carnaval is a fairly recent addition for Arona but it has proved to be a roaring success, and there’s still plenty more to be squeezed out.